Pallas Athena (Arsenio Hall Show, 1993). Pallas Athena (Don’t Stop Praying remix No. 2). Bowie reached over and snapped off the tape. The room fell silent. Watson feared for his professional life. Then Bowie smiled, put his arm around Watson and said: “This guy’s got ears!” “I went from persona non grata to top boy,” Watson recalled. “We got the gig.”* He recalls a charming Bowie who occasionally stopped by the office and offered to make coffee for staffers, and a man who seemed engaged in his record, eager to push it as best he could. Watson proved to be a key piece of Arista’s strategy to promote the record, as he had connections throughout UK clubland and was instrumental in distributing copies of the first track to be released from BTWN, “Pallas Athena.” Arista cut some promo 12″ singles that were only stamped with the track’s title, and Watson and others in the Arista crew delivered them personally to a hand-selected group of influential DJs. The gambit worked in part—“Pallas Athena” was a hit in the clubs—but there wasn’t quite enough time to get out the news that it was David Bowie responsible for the groaning “God…is on top of it all” over a throbbing beat. The simple goal for Arista, Watson said, was to try to make David Bowie cool again. “I loved him more than my mum,” he said, but he noted that being a publicly identified Bowie fan in the UK in the late Eighties meant to expose yourself to ridicule. So having various remixes of BTWN tracks by the likes of Meat Beat Manifesto, Back to Basics and Leftfield (Watson lobbied for Underworld, to no avail—there was a divide in Arista between mainstream dance pop and the underground clubbers) were in part Arista’s means of wrapping up Bowie in something current, to sneak him past the tastemakers and let him be judged on his own merits again. “Pallas” was one of the most radical tracks Bowie had made in years. For one thing, it hardly sounded like Bowie at all, with the disassociated voices akin to the clips of televangelist speeches that Eno and David Byrne had used on My Life in the Bush of Ghosts. (The big question is: is the “God” voice a sample or is it Bowie’s distorted, down-sped voice? I think it’s the latter, but have not found any concrete evidence either way). Its structure seemed influenced not just by whatever house and techno records Bowie had heard, but by minimalist composers like Steve Reich and Philip Glass (see “Weeping Wall”): it’s the link between the second side of Low and Earthling. The melodic material, including the vocal lines, is used stringently and is constantly recycled, subtly changing in the process. Over a bassline that sounds four G notes per bar, a four-note pattern (B-flat-G-A-G) runs throughout the track: it’s carried first via four-bar sets of whole notes on synth and “live” ‘cello, which is then joined by repeating sets of quarter notes on synth violins (triggered by the move to “that’s all”), which in turn is capped by runs of eighth notes on high synth violins (in sync with the drumbeat kicking in), and, lastly, by Bowie’s own distorted “we-are we-are,” singing the same note pattern. The only alteration is the occasional tweak to the bass pattern (changing to Bb-Bb-G-Bb at times). Over this are the chanted refrains: “God is on top of it all,” “that’s all,” and “we are, we are.” The initial run of “God is on top of it all” sounds definitive, striking, even reassuring; God is in control, relax. But as the chant goes on, the message becomes vaguer, more disturbing: is just a map reference, with God simply located at the top level, far removed from us, indifferent to our pleas? The vocal lines start to bleed together. At times the sequence is “that’s all that’s all we are,” other times “we are praying,” (or is it “ready“? ), other times, it’s “we are we are God.” The title adds another element: Pallas Athena was hatched from the head of a god (“from the brow of the super-brain,” see “Song for Bob Dylan”). It gives weight to the vague Gnosticism implied here, that God may be at the top of it all, but we may also be above him. Or it could be a reference to the temple of Athena Nike at the top of the Akropolis, which, if so, then God is an empty ruin standing above a city that no longer worships her. The only free agent is Bowie’s saxophone, which goes on a series of excursions, its phrases often starting with a rising triplet figure and ending with a downward glissando. In the closing minute of the track, the saxophone is joined by Lester Bowie’s trumpet, forming an island of raucous community in an otherwise chaotic song. Recorded ca. summer-autumn 1992, Mountain Studios, Montreux and Power Station, NYC. Released in March 1993 as Arista MEAT 1 (the Don’t Stop Praying Remixes #1 and #2 and the Gone Midnight Mix): these later appeared as the B-side of “Jump They Say,” as a bonus track on the 2003 reissue of BTWN, and on the 2003 reissue of Sound + Vision, respectively. These remixes, along with the album version of “Pallas,” were also released as a digital EP in 2010. A live version of “Pallas,” recorded at Club Paradiso in Amsterdam on 10 June 1997, was issued as the B-side of “Seven Years in Tibet” that same August (it’s also on the revised Sound + Vision). Thanks to Martyn Watson, a longtime blog reader and a very nice guy, for his time and his stories. If you have any more questions for him, I’m sure he’ll respond in the comments. 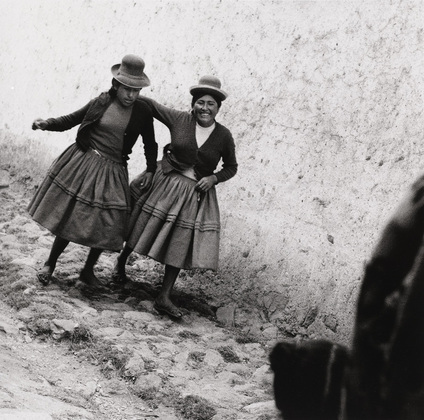 Top: Bastienne Schmidt, “Two Drunk Women, Puno, Peru,” 1992. This entry was posted on Friday, September 28th, 2012 at 9:57 am and is filed under Black Tie White Noise: 1993. You can follow any responses to this entry through the RSS 2.0 feed. Both comments and pings are currently closed. What was the quote from ‘Heroes’ that Martyn spotted? Oooh — I just noticed a sample from the top of “Always Crashing in the Same Car” buried in Don’t Stop Praying Mix No. 2, I wonder if that’s what he meant? I’m sorry that I’m unable to identify the exact track upon which I commented but I remember it as being a somewhat ‘Fripp-like’ motif. The episode was, as reported, really stressful and I wasn’t taking notes! ; ) PS: In addition, we were listening to rough mixes. I assumed it was the saxophone in “The Wedding.” It’s always sounded like an upbeat version of “Neukoln” to me. gah, sorry (and corrected). There’s at least one typo in every entry. thanks again, man. Love this track, it’s one of those tracks that signals what’s coming up. Favorite version is on the Earthling in the City promo. Seems to be a cleaner version of that last one you linked. (It also has my favorite version of Hearts Filthy Lesson and a DB singing Mandarin). Hmmm. Not to dismiss club mixes etc too much (though it will seem that way) but this is a doddle for DB. Specially if you can “borrow” a suitably memorably repeated sample (or invent one – bit of Duchampian readymade or remade play perhaps going on here). But compared to the dire 80s and TM diversions, it’s an improvement of sorts , suggesting a looser sax (rather than guitar) orientated “Let’s Dance vol II ” but it was still DB following trends rather than creating them. Those heady days were over. Still think “life in the bush of Ghosts” was way ahead of it’s time even if it mostly only spawned Fat Boy Slim and a score of producers trying to pump up an otherwise forgettable backing track..
Hi Patrick. Did you buy the fairly recently re-issue of “My Life In the Bush of Ghosts” with the bonus tracks? With 20 minutes of extra material, it’s almost like a three-sided version of its’old vinyl self. Also, I don’t know if you’ve heard it, but another lost gem from around the same time, which always kinda’ reminds me of “Ghosts” is the score from the Broadway Production of “The Catherine Wheel” by David Byrne. Hi No, I wasn’t aware of that, thanks, maybe I’ll check them out. Often tracks are on Youtube. But I notice from Wikipedia that an original track on the album “Quran” got removed very early to avoid sensitivities due to complaints. How prescient for the later clashes between West and East. I said it was ahead of it’s time. I like the tension in this track, one of the best song of BTWN. Love this one, very ominous feel to it, and I always felt it was more of a sister composition of ‘We are the Dead’ than anything else. Great anecdotes by mr Watson. More please. In the club all cats are grey; this faceless track pieced around a sample could almost pass for something from the generation of floppy-beat UK dance music producers — 808 State, Underworld, FSOL, The Orb — around at the time. It’s odd to see someone who learned in the 60s to be “a face” in the Mod sense being this faceless two decades later, but Bowie is famously a sponge, a vampire, a chameleon, a Peter Pan. And when he plays the sax on TV, you instantly see that the track’s true “face” is that of Davy Jones, sax player in The Konrads. Is it just me or is that Arsenio performance super awkward? I think this track really illustrates how much “meaning” is implied in the mood of the music, as much as the lyric itself. Lyrically, there’s not really much more than the line “God is on top of it all”. Yet, for me too, this always implied the question: Is that meant to be re-assuring, that he has everything under control? Or disturbing, that he is silent and indifferent to our cares and concerns? There’s another bit of wordplay/vocal idiosyncrasy that I always really appreciated in the song: the “we are we are” bits are so over-pronounced it sounds like he’s singing “yahweh yahweh yahweh.” That is all. I always thought it sounded like “Wig Out, Wig Out” maybe a case of Chinese Whispers happening here…. Oh FFS! Why such gentle responses/questions so far on this entry!?! Here we have the blogger’s promise of Martyn Watson, who, it has been confirmed, has been in the same room as Bowie in a business meeting, working within the record company, and apparently is now currently commenting and answering questions here in the blog for this entry…why not go for it?? ?…I will!!! 3. I guess the BTWN album has to be viewed as a “failure”: mixed reviews among fans, non-stellar sales, didn’t exactly lead to a bidding war for record labels to take on Bowie again on a huge, mega-star, long-term contract….what failed, in your opinion? Bowie’s music itself on the album? The timing of the music/Bowie coming off as too old in the 1993 climate? Lack of a tour for BTWN? Poor promotion? 4. Mr. Watson, did you have any impression of Nile Rodgers’ involvement/lack of involvement or enthusiasm/lack of enthusiasm for the album??? I kind of feel like Bowie initially sold it like “Nile’s producing again, we’ll make another big hit album!” but then along the way Bowie got disinterested in making “Let’s Dance II” and instead made it a more personal, introspective album, leaving Nile largely side-lined, a producer on paper only. Any thoughts??? No offence taken. David was professionalism personified during his time with Arista; always smart and upbeat. As for ‘Gaydar’, I wasn’t (have never been) concerned with someone’s sexuality and, therefore, it would never have crossed my mind to look for signs as to David’s orientation. In reply to your ‘serious’ questions I believe that the album was only ‘OK’ and that Arista UK’s ‘rock’ promotion/marketing was equally average (the label was much more R&B/Soul/Dance orientated). As for Nile’s enthusiasm I can only comment on the one multi-track that I was able to de-construct in the studio and you’ll have to wait for ‘Nite Flights’ for that. For quite some time I thought this track was just silly. While I like pop, dance/club music mostly just passes me by, no matter which era. But the song has grown on me so I no longer skip it whenever I listen to the album…..
Not the world’s biggest dance fan either but I quite like this one. There’s a drama and an urgency to it that’s missing from most of the album, it doesn’t sound like it belongs there. One of the very few tracks from BTWN I would keep for posterity. Maybe it’s even my favorite. I may be alone in this, but I always thought the line was “God Is UnToppable!” A variation of the “God is Great” line, I suppose. A challenge. Listening to it with earphones I suppose I can hear that last syllable which is supposed to be the “all”, but at times it just sounds like echo of the previous syllable, so I’m still not sure which it really is. I prefer “untoppable” though, more provocative, and more in line with “Loving the Alien” and other Bowie pronouncements … though that praying bit at the 92 concert threw me for a loop. Sometimes I feel the need to work at my job, you know, the one that pays my bills? There’ll be a new entry soon enough. No one has mentioned this, so I will. When I saw the Darren Aronofsky film “Pi” after it came out, I was more than a little struck by how the main motif of Clint [PWEI] Mansell’s soundtrack was for all the world “Pallas Athena” recycled. Thoughts? Yes! I thought the same thing and was scouring these comments to see if anyone else noticed the similarity. I’m not a big fan of BTWN but I have gone back to this track a few times. Bewlay Brian – Good. Then I am not mad! I’ve always loved this song even though I’m meh on the album as a whole. Love this blog and this entry too. But a question: how do we know the “God… Is on top of it all” vocals are Bowie’s? I always thought it was a sample of a black American preacher.